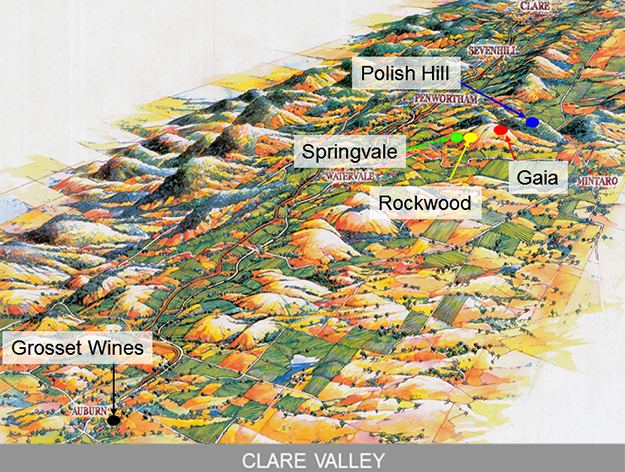 Grosset Polish Hill is produced exclusively from the eight-hectare estate-owned Polish Hill Vineyard (certified organic) in the Clare Valley. The gently sloping site, selected and planted by Grosset more than two decades ago, is comprised of silt and shallow shales over a thin crust of clay and gravel. This overlays a bed of blue slate, estimated to be around 500-million-years old. Relatively close-planted to three clones (two German and one rare local clone), this organic vineyard is completely tended by hand; hand-pruning, shoot and crop adjustment and 100% hand harvesting ensure pristine quality organic fruit is delivered to the (ACO certified) organic status winery at Auburn. No tillage is employed and no fertilisers are introduced: a mix of natural and introduced clovers and grasses are maintained between the vines and allowed to self-seed. Since the first striking example of the wine in 1981, Grosset has maintained a winemaking approach which brings out the best of this unique site.